Our vision is to become the world's leading provider of business management products and services to a variety of small and medium-sized entities. MIM SYSTEM MARKETING & MIM SOFTWARE SDN. BHD. was originally founded in Johor and Penang in the year of 1998. 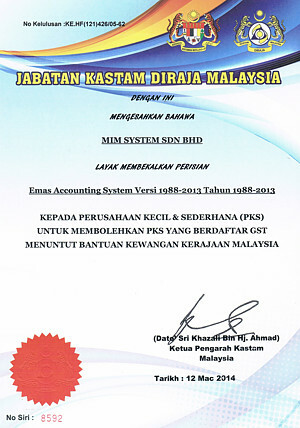 Established as a software firm with a sound vision to empower our clients with effective business management solutions, the company has since been developed based on 2 key modules: EMAS Accounting & EMAS Stock Control Module. Throughout the years, MIM SYSTEM MARKETING & MIM SOFTWARE SDN. BHD. has successfully proven its ability to develop software that could meet the demands of growing business with continuous effort being contributed into product research and development. Currently, MIM SYSTEM MARKETING & MIM SOFTWARE SDN. BHD. has shown its great significance across Malaysia, with stable establishments in many areas namely Alor Setar, Penang, Butterworth, Kuala Lumpur, Melaka, Johor as well as other parts of Eastern Malaysia and even Singapore. Our expertise includes having a team of leading IT personnel with extensive experience in software developing, design, implementation and consultation on a wide spectrum of industries which cater to your specific business needs. Having more than 8 years of proven reputation for our reliability and cost effective business solutions has won us numerous accolades from our customers. MIM SYSTEM MARKETING & MIM SOFTWARE SDN. BHD. has developed and implemented different business workflows which involved not only equipments, but also cabling infrastructure, networking, software, hardware and consultation to facilitate each and every client�s requirements. With a winning combination of hardware and software solutions, and a close working relationship with various hardware manufacturers and network developers, combined with one of the most experienced and qualified technical teams for network installations in the market. We believe MIM is the best position to meet your Information Technology requirements that will certainly bring your company to the next level of advancement.